4Videosoft MTS Converter for Mac is professional Video Converter in converting the MTS videos to other popular videos. You can convert MTS video to other popular video formats like MP4, MOV, M4V, AVI, FLV and more. It allows you to edit your videos with the effect, trim, crop, watermark and merge functions. 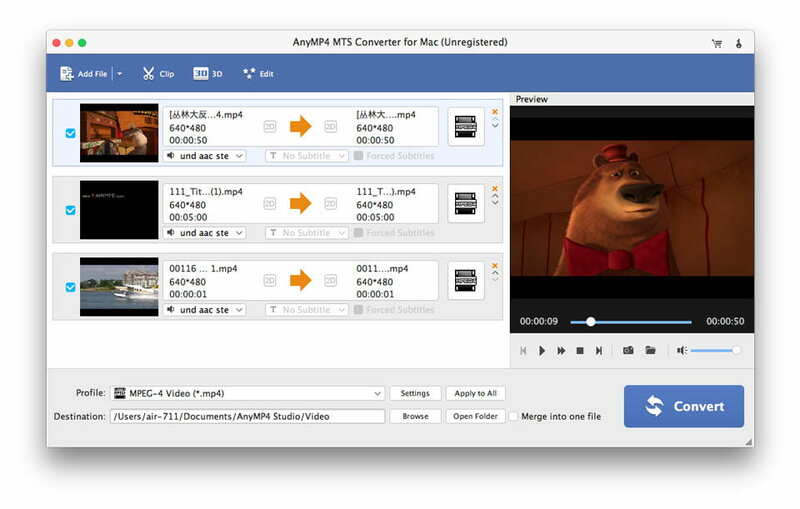 4Videosoft MTS Converter for Mac can convert MTS video to the other formats like MP4, MOV, M4V, AVI, FLV, etc. without any limitation. You can save the output videos to popular video formats such as MP4, MOV, M4V, AVI, FLV, WMV, etc. You are able to play on your portable devices such as Samsung Galaxy S4, HTC, BlackBerry, iPhone 5S/5C, iPhone 5, iPad Air, and iPod touch and so on. 4Videosoft MTS Converter for Mac provides you with powerful editing functions like merge, effect, trim, crop and watermark to optimize the output video as you like. For instance, you are allowed to beautify the video effect by adjusting brightness, contrast, saturation, hue and volume. The MTS Converter for Mac enables you to add your favorite text and image watermark for the output video. You can reset video length and frame as your preference and merge several videos into one. 4Videosoft MTS Converter for Mac enables you to preview the source video and capture your favorite moment. And the snapshot pictures will be saved as default folder. You can finish the conversion with several clicks.